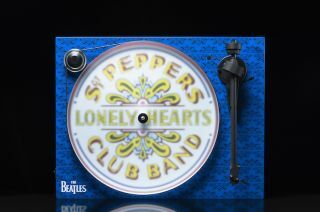 Pro-Ject releases Beatles-themed turntables for Sgt Pepper's 50th anniversary | What Hi-Fi? The Essential III features a decor based on a vintage print of the Sgt Pepper Drum, while the limited edition 2Xperience SB has the logo stamped on its walnut finish. Following the George Harrison and the 1964 turntable, Pro-Ject has announced two further Beatles-themed record players. The first is the "Essential III: Sgt Pepper‘s Drum" which, as you may have guessed, is based on the Essential III turntable. Featuring a 22cm aluminium tonearm with an Ortofon OM 10 cartridge, the turntable will be available later this month, priced £430. The second turntable is the walnut-finished, limited edition 2Xperience SB, which commemorates the 50th anniversary of the Sgt Pepper's Lonely Hearts Club Band album. It has a 9CC Evolution carbon fibre tonearm, and a Ortofon 2M Silver cartridge, along with integrated speed control (for automatic switching between 33.3 and 45rpm). The 2Xperience SB will also be available later this month, priced £1235.